I ate a Big Mac this weekend for the first time since the 2002 Olympics. Maybe I was stuffing my face as I was driving to Park City for a concert I was uber excited for with my evening's company in tow. Cause, ya know, stuffing your face is totally hot, right? The thing is, I didn't enjoy it. Hardly at all. And I saved my Saturday pig out meal for that? Regret. I may have eaten an entire Cafe Rio salad last night to make up for it. Do you like a Big Mac? 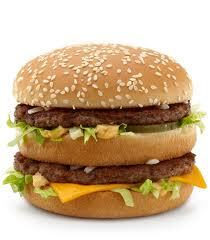 I half expect a muscle man named Mac to come around the corner dancing his pecs when I start talking about Big Mac. Is that weird? Big Macs are gross. The only thing worth going to McDonalds for is their fries. And Pineapple Mango smoothie-ESPECIALLY that. Aw man, now I want one. And the fruit and yogurt parfait. And the occasional grilled chicken snack wrap. Everything else I can take or leave. I prefer the famous star from Carl's Junior, but sometimes I do eat a Big Mac. Sometimes it just sounds good, and I can tell myself that the lettuce helps it seem healthy. If I do get a Big Mac, though, I usually don't get anything else to go with it... ever since watching Supersize Me, I know better than to add fries and a soda to that particular sandwich.